Home Articles News Scientific publications An anti-perspirant… to smell worse? The study was conducted by researchers at Ghent University, Belgium. It aimed at determining whether using deodorants and antiperspirants could modify the structure, diversity and dynamics of the natural bacterial flora that lives under the armpits. And the conclusions are unexpected: anti-perspirants might actually do worse than better! In our society – as reminds this study in its introduction – people are concerned about their personal hygiene and are less tolerant toward bad body odour. The use of underarm cosmetics aims to control sweeting and malodour formation. These products are important for social confidence and improve the quality of life of many people worldwide. Deodorants are substances applied on the human skin to enhance the pleasantness of the skin odour and counteract the odour caused by bacterial breakdown of skin secretions in the axillae, feet and other areas of the body. Antiperspirants are a subgroup of deodorants that affect odour as well as prevent sweating by blocking the sweat glands. According to the European legislation, both deodorants and antiperspirants are categorized as cosmetics. Important bacterial groups colonize the axillary region. Each bacterial species in the community has its own enzymes, converting non-odorous sweat into volatile compounds. Actinobacteria are considered to be responsible for a strong axillary malodour. A range of antimicrobials are added to deodorants and antiperspirants to decrease the density of the skin bacterial community. Propylene glycol, triclosan, Benzalkonium chloride and aluminium salts are regularly used in deodorants and antiperspirants and possess antimicrobial and antifungal properties. Certain flavouring agents, such as cinnamaldehyde, Eugenol and geraniol possess antimicrobial possess antimicrobial properties. These ingredients help ton decrease the abundance density of skin microbiota, although complete elimination cannot be obtained. Some people indicate that the use of deodorants and antiperspirants leads toward a less pleasant axillary odour. Little is known how the use of deodorants and antiperspirants affect the underarm bacterial community. It is unknown whether the ingredients have a broad-spectrum effect, or rather target specific odour-causing microbiota. The objective of this study was to identify whether deodorant/antiperspirant usage could affect the autochthonous microbial community structure, diversity and dynamics. The effect of deodorants and antiperspirants on the axillary bacterial community was examined on nine healthy subjects, who were restrained form using deodorant/antiperspirant for 1 month. Denaturing gradient gel electrophoresis was used to investigate the individual microbial dynamics. The microbial profiles were unique for every person. 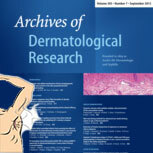 A stable bacterial community was seen when underarm cosmetics were applied. A distinct community difference was seen when the habits were changed from daily use to no use of deodorant/antiperspirant and vice versa. The richness was higher when deodorants and antiperspirants were applied. Especially when antiperspirants were applied, the microbiome showed an increase of diversity. Antiperspirant usage led toward an increase of Actinobacteria, which is unfavourable situation with respect to body odour development. These initial results show that axillary cosmetics modify the microbial community and can stimulate odour-producing bacteria. This study was published in the journal Archives of Dermatological Research .